Robust rattan climbing to 8 m tall. Stem without sheaths probably c. 25 mm diam., with sheaths 35 - 50 mm diam. ; internodes apparently short, c. 10 cm long. Leaves cirrate, to 4 m long; sheath dull red brown, densely armed with straw- coloured flattened black-tipped triangular spines 10 - 45 x 2 - 4 mm, the surface of the spines frequently obscured by a very dense layer of pale grey or brown tomentum c. 1 mm thick, spines around leaf sheath mouth apparently erect, some to 150 - 180 mm long; knee absent; petiole to 50 cm long, 25 x 13 mm in section, adaxially flattened near the base, slightly convex distally, abaxially rounded, armed with scattered or abundant spines on all faces, those on adaxial surface generally short, to c. 10 mm or less, those on abaxial surface and margins to 85 x 4 mm, the spines solitary or in groups of 2 - 4, all spines bearing the same thick tomentum as that on the leaf sheath spines; rachis armed distally with grapnels of 3 - 4 reflexed black-tipped yellowish spines to 10 mm long and scattered single shorter spines, caducous pale grey or brown tomentum abundant on rachis surface; leaflets 60 on each side of the rachis, c. 3 - 4 cm distant, regularly arranged, 35 - 45 x 2 cm, armed with 2 rows of black bristles adaxially, abaxially apparently unarmed, the margins sparsely bristly. 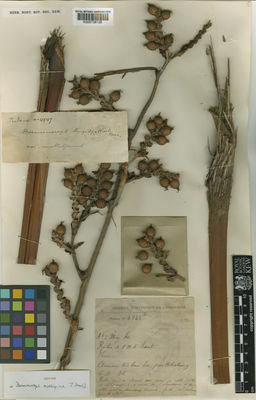 Inflorescence (only fragments of pistillate known in almost mature fruit), probably very large; peduncle, prophyll and rachis bracts not preserved; distal portion of infructescence with 10 partial inflorescences preserved in two herbarium sheets (K, P), c. 75 cm long, the partial inflorescences c. 8 - 9 cm distant, each with a dark red brown pulvinus at the base, the lower partial inflorescences to 18 cm long with 6 rachillae to 8 cm long, 2 - 3 mm diam. ; bracts subtending rachillae reddish-brown, papyraceous, c. 10- 15 x 8 mm, splitting irregularly; rachilla bracts triangular, acute, brown, papyraceous, c. 5-7 mm long with dense grey tomentum near the base, distally glabrous. Staminate and pistillate flowers unknown. Calyx of pistillate flower persisting in fruit, irregularly split, c. 4 mm long; petals persistent, c. 7 x 4 mm. Immature fruit barrel-shaped, 13 x 11 mm, including a conspicuous beak 3 x 2 mm, tipped with the remains of the reflexed stigmas to 3 x 1 mm; pericarp covered in 15 vertical rows of pale brown scales to 1.75 x 1.75 mm exposed, with deep central grooves and darker brown margins. Seed very immature in available material. Robusta, bracteis rhachidum et rhachillarum conspicuis D. ruptili Becc. et D. longispathae similis sed vaginis foliorum spinis dense et conspicue molle-indumentosis fructibus orculiformibus distincta.